The converged media era is truly upon us. Consumers are exerting greater control over the content they watch and how they choose to engage. Audiences are fragmenting and your competitors are finding innovative ways to unlock new revenue streams. Commercial approaches are evolving across the industry to reflect the new media landscape. In response, BrightTALK is delighted to bring you The Media talks Media Channel – a gathering of the most dynamic decision-makers from across the media spectrum. Through a series of presentations, you will have the opportunity to gain an inside track on your peers’ commercial strategies - top level decision makers from some of the most recognisable brands in media. 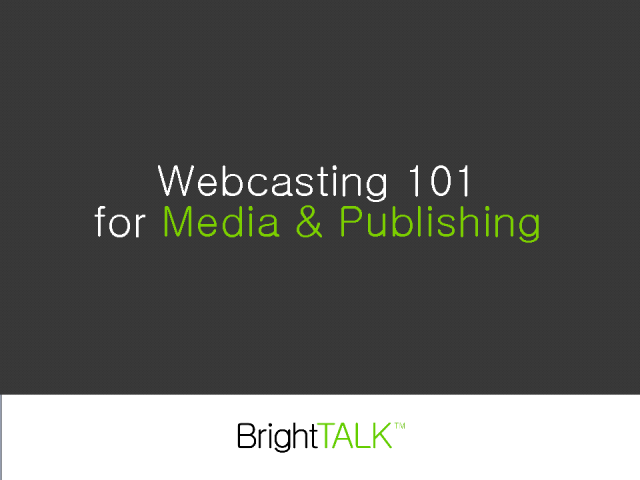 Learn proven tips and best practices for developing a webcasting strategy for media and publishing companies in this complimentary webcast. * What is webcasting and how does it fit into a media property? Building next generation advertising capabilities in lead generation. This advertising recession is far deeper than the last, with multi-year, double digit annual declines likely across many sectors, ranging from B2B publications to newspapers to magazines to TV stations. Many marketers are using the cyclical downturn to accelerate shifts that were already well underway, increasing investments in their own websites, database marketing, and custom media at the expense of ad budgets. They are prioritizing opportunities further down the purchase funnel to build customer relationships, drive leads, and deliver greater accountability and ROI. This is especially true for categories with high customer involvement before the purchase. While this makes intuitive sense in business media where the value of a lead can be quite high, but is also true in consumer categories such as travel, consumer electronics, health and beauty, and home improvement that have very high consumer engagement along the path to purchase. Media company efforts to build stronger advertising solutions to differentiate their content and defend their pricing premiums are necessary, but insufficient to stem these ongoing pressures. Yet while marketers' shift in spending away from advertising to other forms of spending further down the purchase funnel creates pressures, it also creates opportunities for media companies that build next generation capabilities around lead generation. In this audio webcast, Booz & Company will share its recent experience for how leading media companies are building innovative new approaches for lead generation. Matthew Egol, a partner in Booz & Company's global media team, will describe the four successful models for lead generation and the capabilities required for successful execution.